The Adidas Solar Boost offered a snappy ride, wrote a reviewer. The boost™ midsole supplied added bounce and encouraged a quicker pace, mentioned a runner. Others said it provided a cushioning that was more accommodating than expected. A user claimed that the outsole had a broad heel that enhanced ground feel. Various commenters agreed the shoe possessed a stylish appearance that was suitable for casual wear. Many buyers thought the Adidas Solar Boost was expensive. One wearer complained the arch support was missing from the shoe. The Adidas Solar Boost delivered what runners would expect from a road running shoe: comfortable, responsive, and efficient. Many users were satisfied with the performance brought about by the shoe, and they found a bonus in its trendy look. Despite the high price point and other relative criticisms, the Solar Boost seems to have proven that it enables a fantastic running adventure. I opened the box and, wondered what our friends from Herzogenaurach have been up to. I had been expecting more of a lifestyle-running shoe, something more like the Brooks Revel. 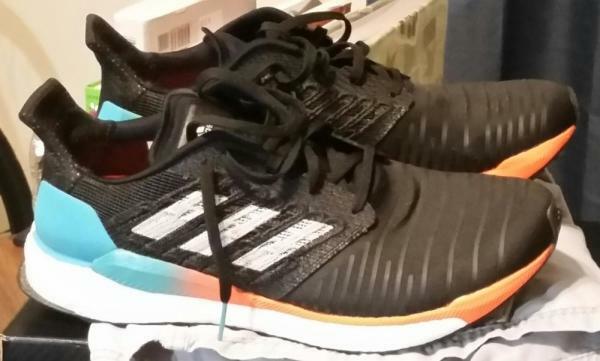 However, I was surprised and pleased to discover a pair of the most serious, and competent looking, road running shoes that I have ever seen. Looks like a neutral shoe, with a touch of stability. Miami-Vice retro colors…so many colors in one shoe! Only 10 lace eyelets on each shoe (instead of 14). Obviously, lots of engineering went into this shoe. Typical German attention to detail. Wow, I had continental tires on my Volkswagen…now they are on my shoes! I wonder if these stripes are reflective, thinking of safety. These things must be very expensive to build. Is there enough toe box height? Adidas doesn't follow a cookie-cutter approach; these shoes actually dare to be different. These shoes offer a really smooth interior, with a wide toe box and, even though the toe box height is a bit low. The material was so compliant to the shape of my foot; that the actual height didn't matter. The outsole rubber is optimistically thin, the famously durable, Continental rubber makes up the outsole and, is said to be good for 500 or more miles of road running wear and, I intend to find out. This shoe proves my theory that the midsole is the heart of any running shoe. With BOOST at work and EVA forming support rails, (Adidas may have a more formal product name for them) along either side, leading back to an external heel counter, which is a thin two-piece hard plastic component. There is a clever plastic piece called, the "Torsion System," running forward from under the arch and, forward along both sides of the forefoot. This “Torsion System” also extends to the rear along the medial edge of the heel and, provides extra stability. Not simply a single piece of mesh; this upper really deserves the term "Engineered” mesh. The forefoot has multiple narrow overlays running across it with a thin internal toe piece added for structure. There is an internal bootie that conforms to the shape of your feet, running from the tip of the toes to the rear sides of the tongue, providing a comfortable and durable forefoot. The forefoot material is compliant to the shape of your foot, and the multiple narrow overlays assure they return to their original shape. At midfoot, there is a generously woven saddle extending from the midsole to the arch and up towards the laces; serving to anchor your foot in place. The collar extends upward in the back, making it easy to grab when you are inserting your foot. I didn't know how bad things were until I tasted the BOOST! No, I didn't exactly eat my new Adidas midsoles, but I did get a taste of what has got to be the most resilient foam ever dreamed up and, if they were edible, they would taste like the finest Lasagna from the very finest old world Italian restaurant. I love these shoes; I may put my Nike Structure 21 away, with the winter socks, until next winter. First run was my usual 7-mile hilly route, at 43 degrees F; there was no wind. Initially, I noticed that the forefoot was airy, but the big news was in the bounce…it was an enjoyable and lively feeling. My ankles did touch the collar on uneven roadways. However, I am going to ignore this and, rather than putting an insert under my heel, and risk maligning the character of this shoe. I am looking forward to getting in many more miles with these shoes. The outsole doesn't pick up rocks and, the laces do stay tied… there is no heel slippage. The quality of material and workmanship appears to be very high. 12 D U.S. / 46.5 E.U. / 11.5 U.K. / J.P. 300. A complete review with, a total listing of specifications will follow, here on RunRepeat. The Adidas Solar Boost - A little BOOST…goes a long way! As long ago as 1924, Adolf (Adi) Dassler and his brother Rudolf, began building sports shoes at home. Eventually, they formed the Gebrüder Dassler Schuhfabrik (Brothers Dassler Shoe Factory) in the small Bavarian Mittel Franken, town of Herzogenaurach, Germany. Adidas shoes went to the Olympics for the first time in 1932 and, later helped Jesse Owens win 4 Gold medals; all while setting both World and Olympic Records in the 1936 Berlin Olympics. 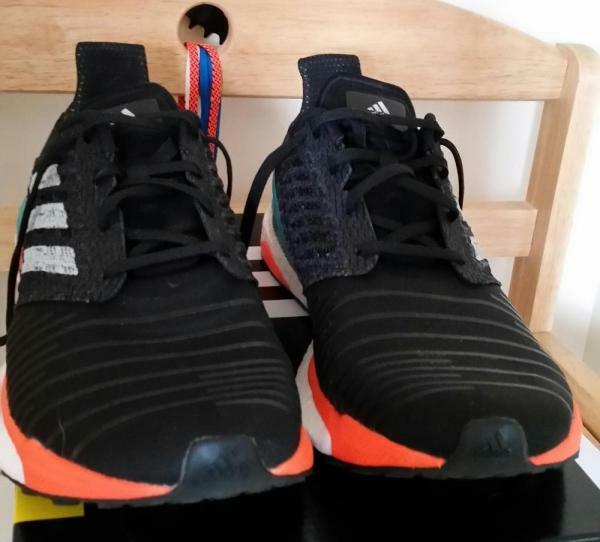 The shoe that is the subject of my review today is the Adidas Solar BOOST; a very well-constructed, medium weight, road running shoe. The Solar BOOST is listed as a neutral running shoe; however, with its Torsion System and arch wrapping support…I say that this model blurs the distinction between Stability and Neutral. This model may indeed become the Swiss Army Knife of running shoes! From the AUTOBAHN to MARATHON, Continental is very well known for their tires. They also make the outsoles used in this very model of Adidas. These outsoles are optimistically thin, which obviously saves weight. This part of the shoe sets a new standard for durability; with some runners reporting running over 750 miles in Continental outsoles and, with little noticeable wear. The heart of this Adidas, is truly a world-class design and, it uses a substance called BOOST foam to achieve this fame. BOOST foam, I discovered, is made from a TPU (thermoplastic polyurethane) that is not simply cut from a solid block of foam, but is composed of individual pellets as well. These pellets are molded while under pressure and, with steam, partially keep their original shape after leaving the mold. The resulting BOOST technology provides durability, cushioning, and a rebound that is hard…if not impossible to match. These uppers really deserve the term "Engineered” mesh. The forefoot has multiple narrow overlays running across it, with a thin internal toe cap added to keep the shape of the front end. These uppers are built with a yarn that features Parley Ocean Plastic™ and, are made from recycled plastic waste. Better in the shoes than in the world's oceans…bravo adidas! There is an internal bootie that adds a second layer of durability to the forefoot, something I greatly appreciate. I have had my toes wear through many other models. The internal bootie runs from the tip of your toes to the rear sides of the tongue. This provides extra comfort and, tempts me to consider running sans socks. The forefoot material is compliant to the shape of your foot, and all those multiple narrow overlays assure that the original shape is maintained. At midfoot, there is a generously woven saddle extending from the midsole arch and, going up to meet the laces…anchoring your foot securely. The three stripe logo, on the lateral side of each shoe, helps with support and, looks cool. The collar extends upwards in the back, making it easy to grab while you are inserting your foot. This is an excellent feature…as you cannot easily insert your foot without mashing the collar. Running in these shoes has been very enjoyable. They seemed to open up a new level of excitement for me. I am totally pleased with the performance. They actually excelled in every category that I could think of, comparable to my Nike Structure 21. See review here. My first run was my usual 7-mile hilly route, at 43 degrees F. There was no wind, and immediately, I noticed that the forefoot was very airy…a very pleasant feature for runners during the summer months. The big news, however, was in the bounce…it was an enjoyable and lively feeling. I think that the outsole is helping to provide some of the energy return by stretching, and them releasing energy, at the end of the gait cycle. Working together in unison, with the BOOST foam, this provides a snappy and responsive ride. My longest run in these shoes, thus far, has been a slow 11-mile tour of the local hills. I must admit, the comfort on this longer run seemed to be on par or, even better than, any of the Asics models and their patented Gel. The SOLAR BOOST does not feel as heavy as the scale indicated; perhaps that is due to the energy return. The outsole doesn't pick up rocks and, the laces do stay tied…there is almost no heel slippage. The winter socks that fit so well in my Nike Structure 21s are a bit too tight in the Solar BOOST…making this Adidas a true summertime, sunshine shoe. Running in this model of Adidas shoes will make you feel as if you were running in the shadow of the great Norwegian marathoner Greta Waitz and, you couldn't be in better company! As quickly as many of us go through running shoes…our yearly costs can soon become something we might not want to think about. However, by considering the durability of the BOOST foam-Continental outsoles, you will likely find them to be a more affordable alternative than less expensive shoes, such as the Brooks Ghost. See my review of the Ghost here. Running is a science of physics and physiology and, running shoes are simply the tools that are used in that discipline. The Boost midsole and its Continental outsole are years ahead of most of the competition. If you have a favorite brand of shoe or color you like best, it may serve you to put those thoughts aside. You owe it to yourself to try the Adidas Solar Boost and, when you do, you'll know what I am talking about. Thanks for reading... see you at the starting line! The new, colorful Adidas Solar Boost initially appears to be a stability running shoe. But the seeming medial post is actually there to stabilize the heel during running. Moreover, it also has the appearance of a light trail running shoe with an outsole that’s flared at the front of the shoe and excess rubber that extends beyond the heel at the rear. However, it’s not a stability shoe or a light trail shoe, it’s a neutral running shoe. The Solar Boost weighs 8.95 ounces and feels light on the road. It has a 10mm heel drop and offers the same midsole found on the Adidas UltraBoost. To me, the Solar Boost feels like a cross between the PureBOOST DPR performance trainer and the Adizero Tempo 9. It feels low to the ground, like the PureBOOST DPR – deconstructed performance racer, and yet offers the same rebound properties delivered by the Tempo 9. The Solar Boost provides nice, bouncy responsiveness no matter what the surface; concrete, asphalt or a light trail road with dirt and crushed gravel. As usual, the Continental Tire rubber outsole provides legendary grip which makes for fun runs on light trails. The Solar Boost is as stable as needed by the great majority of runners and one of its strengths is a mid-foot Torsion System shank. The shank provides a sense of structure at both low and high speeds – which is why they are often found in premium racing flats, and it ensures that the shoe never feels flimsy. As per Adidas, the Torsion System shank provides for smooth landings and midfoot-support at push-off. The key feature of the Solar Boost is an upper with what Adidas calls Tailored Fiber Placement (TFP) technology. The TFP upper holds the foot securely in place while not causing discomfort for the top or sides of the foot. I found the fit on the Solar Boost to be reminiscent of a well secured flat, but without being tight. And there’s no irritating pressure on the top of one’s feet. Is the Solar Boost snug? Yes. Some will be able to run in their usual running shoe size; but fortunately, I received a sample that was a full size up from my walking shoe size. The fit was perfect; a smaller size might have been uncomfortable on a longer run during which feet may experience some swelling. Note that the Solar Boost comes with a large, thick insole that reduces the available foot volume. I removed it immediately and replaced it with a racing flat insole. This switch made for a more comfortable fit. Having wider, non-narrow feet is not an issue with the Solar Boost. As Adidas notes, the shoe is “built on a wider last for a more accommodating fit.” This is a positive development. Let’s hope that some other running shoe companies follow suit! The Solar Boost will be available on May 17, 2018, and will retail for $160.00. The Solar Boost is a comfortable, protective, responsive and durable trainer. Stay tuned for two detailed, comprehensive reviews of the Adidas Solar Boost that will appear in the near future on RunRepeat. The Adidas Solar Boost was comfortable right out of the box. The upper has a sock-like feel, with some extra room in the toe box, without leaving the foot too free to move within the shoe. Each stride meets the pavement with a pillowy softness and a smooth transition from a midfoot strike to toe off. The Solar Boost adds a bit of stability to the flexible, smooth, heel to toe transition that has previously been seen in the Adidas Ultra Boost. The upper is a bit thicker and doesn’t allow for moisture release as well as a lot of other shoes on the market today. For this reason, the shoe may not be quite as good of an option for some runners during the hot summer months. The best quality in the upper is the secure and comfortable tongue, heel and ankle liner. The tongue is securely attached to the upper to prevent slipping. The high ankle and tab prevent heel slippage and movement while running. Adidas shoes have typically run very narrow on me and the Solar boost is an exception. The foot has plenty of freedom to move naturally in the shoe, without feeling too big. The Adidas Boost technology offers incredible energy return with a smooth heel to toe transition. When landing, the heel strike feels incredibly pillowy soft. 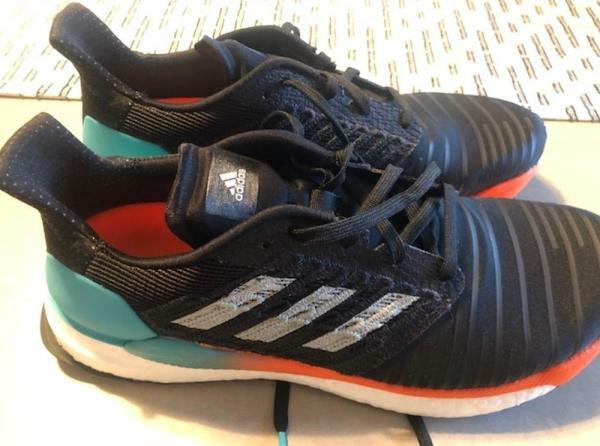 The Solar Boost is a bit more structured than other Adidas offerings, this is due to the Solar Propulsion Rail that works with the Boost technology to increase stability. Overall, the Solar Boost feels like a typical neutral trainer and not quite a stability shoe. Adidas shoes tend to feel a bit more flexible and unstructured however the Solar Boost offers just enough stability so that it doesn’t feel like you are running in socks. The Adidas Solar Boost outsole includes the Continental bottom that grips the road like no other shoe in the market. Adidas shoes are currently head and shoulders above any other shoe in terms of traction and connection to the ground with every stride. In any conditions where footing is the least secure, the Continental traction system excels and provides the runner peace of mind in knowing they are less likely to experience slipping in any stride. The Transition phase from landing to toe-off is incredibly smooth. The combination of the Adidas Torsion System, the traction of the Continental outsole, and the spring of the Boost technology make the Adidas Solar Boost a great everyday training option. In addition, the wide toe box makes the shoe adaptable for all runners and allows the foot to move more freely than other Adidas models. Running enthusiasts might be familiar with the name of this Adidas running shoe, as a similar release was made a few years ago. The Adidas Solar Boost is now redesigned, including an overhaul of its construction and technologies. While some might notice the silhouette is the same as the original version, it is worth noting that this edition adds crucial features that the previous one lacked. The Solar Boost uses an all-new, premium technology dubbed the Tailored Fiber Placement (TFP) to create an overall lightweight shoe. This process confirms a secure fit while also permitting a convenient way of wearing the shoe. Aside from the new method, the Solar Boost also favors new materials in the development of the upper, such as the Parley midfoot cage. Meanwhile, the sole unit consists of familiar and trusted characteristics, namely the boost™ midsole compound and the Continental™ and Stretchweb® rubbers for the outsole. Although the boost™ was also present in the original version, this shoe takes the technology and utilizes it better, resulting in improved performance for the runner. It also exhibits a new unit: The Solar Rail Propulsion technology. The Adidas Solar Boost applies the length and sizing of a standard running shoe. While it has a noticeable semi-linear construction from the forefoot to the heel, its featured technologies allow the shoe to deal out a secure and contoured fit for the runner. The Adidas Solar Boost is available for purchase in medium width for both the men’s and women’s versions. Like most of Adidas’ running shoes, the Solar Boost is spruced up by the outsole tandem of Continental™ and Stretchweb® rubber compounds. More than just fancy installations, these elements work hard to make the outsole efficient. The Continental™ outsole material is as rough and durable as car tires, and this is because they are from the same rubber compound. Such a material ensures that the Solar Boost is equipped with sufficient grip capabilities. With its sturdy figure, runners can rely on the Continental™ to protect the shoe and their foot against injuries, damages, and abrasions. On the other hand, the Stretchweb® rubber of the Adidas Solar Boost aids in absorbing shock and shielding against impact. The material gives the outsole a flexible property so that the stride has an enhanced comfort level. It also lends reinforcement to the foot to permit natural movements. This is the same outsole materials used in the popular Adidas Ultra Boost 19. Adidas’ boost™ technology makes its way back in this update of the Solar Boost. In the previous version, the midsole compound was only in the heel area. Therefore, as an upgrade, boost™ now contributes to the entire length of the shoe. The boost™ is comprised of thousands of thermoplastic polyurethane (TPU) pellets that a shaped as a single unit to furnish the ultimate degree of energy return. Compared to conventional foams, boost™ possesses a unique structure that lets it absorb and release energy differently, resulting in an ultra-responsive shoe. The boost™ material is also resistant to extreme temperatures and longer-lasting than traditional midsoles. Another modern technology exists in the shoe – the Solar Propulsion Rail. It works similarly to a shank, as it dispenses stability and balance while also guarding the underfoot. It is partnered by the Torsion® System, a plastic unit inserted in the midfoot area, to enable an amended transition and overall gait cycle. The upper is where most of the relevant features of the Solar Boost are abound, which are technologies that set them apart from other running shoes. The first release of the Solar Boost employs a breathable mesh that promotes a second-skin sensation while refining support and relief for a stable ride. While all of these are in the current version, a new attribute aids the upper, called the Tailored Fiber Placement (TFP). The TFP is a knitting process that gets the fibers close together, resulting in a protective and robust fabric. TFP contributes to the shoe’s minimal weight while also providing an accessible entryway for the foot. It supplies the Solar Boost a sock-like feel that hugs the foot in all its contours. A midfoot cage made from Parley plastic – an environment-friendly material sourced from plastic debris from the ocean – offers structural integrity and a supportive figure for the Solar Boost. Additional defensive elements come in the form of a TPU toe cap that shields the forefoot from injuries caused by accidental kicks, and a stiff heel cup that accommodates and backs a wide range of foot shapes.